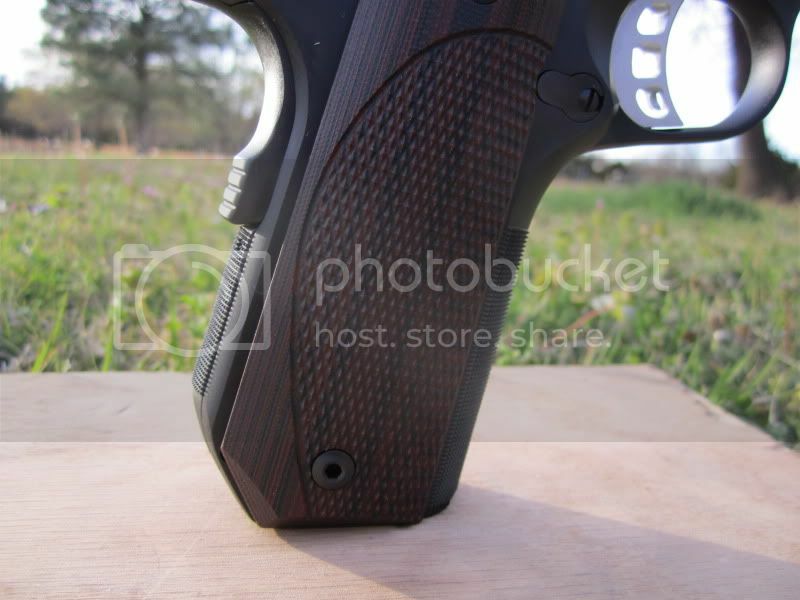 After looking through the 1911 photo thread in "Photos and Videos" I realized there seem to be more people running synthetic grip panels than wood. Is there a particular reason or it is just "what it happen to have on it when I bought it"? Yes, I have a plastic gun and carry it in kydex but my 1911 has wood and carries in leather. Anyone else old school, like me? I like the Houge thin rubber 1911 grips. My 1911 has no checkering on the frontstrap so the rubber gives a little something to hold on to. Being a person with fat little hands thin grips make my reach better and I prefer a "short trigger" on the 1911 for the same reason. The Pachymyer and Houges with the wrap around rubber on the front are just too thick for me. Put me in for wood factory style grips too... but on a carry gun the finish wears off on the left side where my shirt buffs the wood... a good set of wood stocks runs over $50 (MSRP) the Houges around $25... and they last a lot longer on a carry gun. Still running my everyday 1911 in a Bianchi 3S Pistol Pocket thats old enough it doesnt have the thumb-break on it. I have a Hunter belt holster with a tension screw for belt carry. If a Commander size gun comes in Santa's bag this year I may go KYTAC IWB for that pistol. If a Commander size gun comes in Santa's bag this year I may go KYTAC IWB for that pistol. That may be the ticket right there, Burk. David's a pretty good engineer when it comes to holster design. Is that one of yours? The Kimber looks familiar. Not to sidetrack... but I have noticed that Stainless guns really get scuffed up when pressed into daily duty. I've been eyballing a second hand Kimber Pro Carry (?) or whatever the variation is and a Colt Defender that could both stand a little TLC on the finish. Tuesdays and Thursdays were good... Soccer is winding down and I have some back up for Boy Scouts .... but other days are fine too. I appreciate having a place to go. Guns are funny. I "need" a Commander sized gun so I can send my Government off for sights, "reliability" work (like it needs it) and a re-blue or maybe a high tech wear proof finish after a good melt job. I have the stock rubber grips on my SW 1911. I've tried grim reaper grips and Hogue combat grips, but it just looks ugly with anything other than the stock rubber so far. Maybe some of those textured Micarta grips would look good. Segue from a segue, I picked up a kydex holster for the 1911, so I can use it the next time I can make it to a pistol match. If it starts polishing the satin finish, I'll switch to leather. Got a picture of the VZ's? I have VZ ETC's on my commander. I like them for carry since there is only texture in the palm/finger area and the rest is smooth. Bryan...the more I see that AI Commander the more I like. You shot well with it Sunday too.